Nokia phones are back on US carrier store shelves as of today. 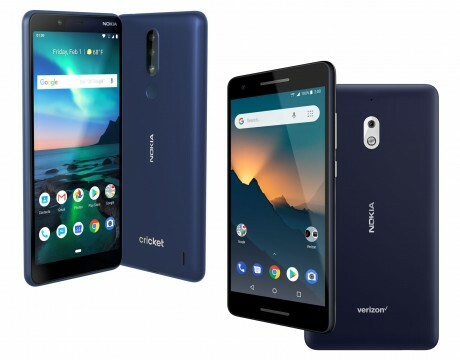 The Nokia 3.1 Plus goes on sale today with Cricket, and Verizon will start selling the Nokia 2 V on January 31st. The announcement was made today by HMD Global, the independent company formed by ex-Nokia employees when Nokia stopped making its own phones. HMD licenses and has exclusive use of the Nokia brand for phones. The company plans additional phones for US carriers this year. "Our approach to operator relationships is not transactional — our users will see more devices at different price points launching with our prepaid and post-paid wireless prover [sic] partners and on the open market", said Maurizio Angelone, Vice President Americas for HMD Global. The Nokia 3.1 Plus has a tall (2:1) 6-inch HD screen, 3,500 mAh battery, fingerprint reader, NFC, and Snapdragon 439 processor with 2 GB RAM. It has dual rear cameras including a 13 megapixel main sensor. It sells for $160 from Cricket. The Nokia 2 V has a huge 4,000 mAh battery for "two-day battery life". It also has a 5.5-inch HD display, Snapdragon 425 processor, 8 megapixel main camera, and 8 GB storage plus a memory card slot. Pricing was not announced for the 2 V.
HMD Global today announced the Nokia 7 Plus, a large Android slab machined from a single block of aluminum with copper accents. HMD Global says the rear is coated with a "ceramic-feel" paint for texture.